In today’s tutorial, we will look at how to build a sensor application to measure the ambient light. We will create a new Universal Windows Platform application project. This time, we call it Sensor. We can use the Raspberry Pi 3, even though we will only use the light sensor and motion detector (PIR sensor) in this project. We will also add the latest version of a new NuGet package, the Waher.Persistence.FilesLW package. This package will help us with data persistence. It takes our objects and stores them in a local object database. We can later load the objects back into the memory and search for them. This is all done by analyzing the metadata available in the class definitions, so there’s no need to do any database programming. Go ahead and install the package in your new project. The Waher.Persistence.Files package contains similar functionality, but it performs data encryption and dynamic code compilation of object serializes as well. These features require .NET standard v1.5, which is not compatible with the Universal Windows Platform in its current state. That is why we use the Light Weight version of the same library, which only requires .NET standard 1.3. The Universal Windows Platform supports .NET Standard up to 1.4. For more information, visit https://docs.microsoft.com/en-us/dotnet/articles/standard/library#net-platforms-support. Here, Types is a static class defined in the Waher.Runtime.Inventory namespace. We initialize it by providing an array of assemblies it can use. In our case, we include the assembly of the persistence library, as well as the assembly of our own application. The first parameter defines a folder where database files will be stored. In our case, we store database files in the Data subfolder of the application local data folder. Objects are divided into collections. Collections are stored in separate files and indexed differently, for performance reasons. Collections are defined using attributes in the class definition. Classes lacing a collection definition are assigned the default collection, which is specified in the second argument. Objects are then stored in B-tree ordered files. Such files are divided into blocks into which objects are crammed. For performance reasons, the block size, defined in the third argument, should be correlated to the sector size of the underlying storage medium, which is typically a power of two. This minimizes the number of reads and writes necessary. In our example, we’ve chosen 8,192 bytes as a suitable block size. The fourth argument defines the number of blocks the provider can cache in the memory. Caching improves performance, but requires more internal memory. In our case, we’re satisfied with a relatively modest cache of 1,000 blocks (about 8 MB). Binary Large Objects (BLOBs), that is, objects that cannot efficiently be stored in a block, are stored separately in BLOB files. These are binary files consisting of doubly linked blocks. The fifth parameter controls the block size of BLOB files. The sixth parameter controls the character encoding to use when serializing strings. The seventh, and last parameter, is the maximum time the provider will wait, in milliseconds, to get access to the underlying database when an operation is to be performed. We define the method as asynchronous at this point, even though we still haven’t used any asynchronous calls. We will do so, later in this chapter. Since the method does not return a Task object, exceptions are not propagated to the caller. This means that they must be caught inside the method to avoid unhandled exceptions closing the application. Values we sample may include different types of errors, some of which we can eliminate in the code to various degrees. There are systematic errors and random errors. Systematic errors are most often caused by the way we’ve constructed our device, how we sample, how the circuit is designed, how the sensors are situated, how they interact with the physical medium and our underlying mathematical model, or how we convert the sampled value into a physical quantity. Reducing systematic errors requires a deeper analysis that goes beyond the scope of this book. Random errors are errors that are induced stochastically and are often unbiased. They can be induced due to a lack of resolution or precision, by background noise, or through random events in the physical world. While background noise and the lack of resolution or precision in our electronics create a noise in the measured input, random events in the physical world may create spikes. 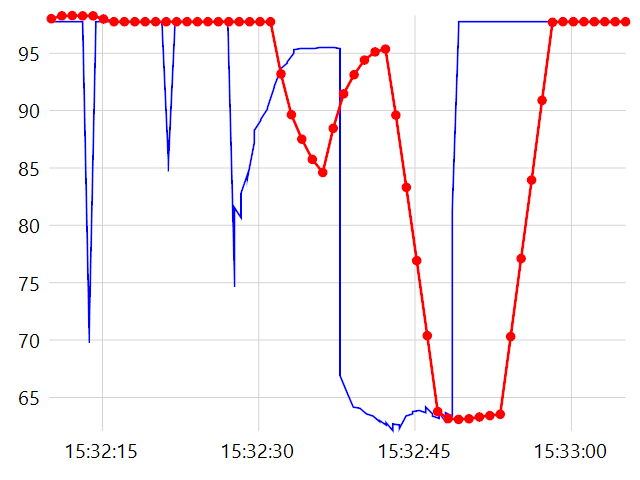 If something briefly flutters past our light sensor, it might register a short downwards spike, even though the ambient light did not change. You’ll learn how to correct for both types of random errors. If we perform the average over 10 values, we effectively gain one power of 10, or one decimal, of resolution in our output value. The value will be delayed 10 seconds, however. This algorithm is therefore only suitable for input signals that vary slowly, or where a quick reaction to changes in the input stimuli is not required. Statistically, the expected average value is the same as the expected value, if the input is a steady signal overlaid with random noise. We use nullable integers (int? ), to be able to remove bad values later. In the beginning, all values are null. It is not sufficient for a sensor to have a numerical raw value of the measured quantity. It only tells us something if we know something more about the raw value. We must, therefore, convert it to a known physical unit. We must also provide an estimate of the precision (or error) the value has. A sensor measuring a physical quantity should report a numerical value, its physical unit, and the corresponding precision, or error of the estimate. The class is decorated with a couple of attributes from the Waher.Persistence.Attributes namespace. The CollectionName attribute defines the collection in which objects of this class will be stored. The TypeName attribute defines if we want the type name to be stored with the data. This is useful, if you mix different types of classes in the same collection. We plan not to, so we choose not to store type names. This saves some space. The Index attribute defines an index. This makes it possible to do quick searches. Later, we will want to search historical records based on their timestamps, so we add an index on the Timestamp field. We also define an Object ID field. This is a special field that is like a primary key in object databases. We need it to be able to delete objects later. You can add any number of indices and any number of fields in each index. Placing a hyphen (-) before the field name makes the engine use descending sort order for that field. You can now execute the application, and monitor how the MinuteValues collection is being filled. 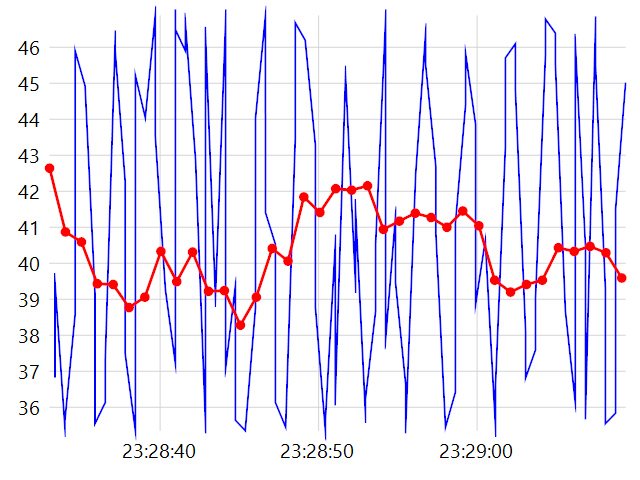 We created a simple sensor app for the Raspberry Pi using C#. You read an excerpt from the book, Mastering Internet of Things, written by Peter Waher. This book will help you augment your IoT skills with the help of engaging and enlightening tutorials designed for Raspberry Pi 3.